In 1997, the first and only recognised training course for wildlife law enforcers began. 17 years later and the course is still going strong, and has just trained the 1000th student on to the course in April this year. 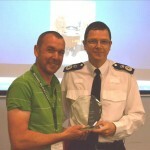 The award for the 1000th student was presented to Jeremy Moore of Staffordshire Police by Chief Constable Alex Marshall, the Chief Executive of the College of Policing. Historically, training in wildlife and environmental law enforcement had been on an ad hoc basis, as arranged by private individuals or police forces up until 1997. To address this inconsistency, a Training Needs Analysis was completed in 1996, which revealed an enormous desire for training on a whole range of issues. This resulted in the Wildlife Law Enforcement Steering Group researching the possibility of running a generic training course. Warwickshire Police established and ran the first of the courses in 1998, and has continued to run two courses a year ever since. Following the success of the Warwickshire Police course, the Ministry of Defence Police carried out a similar course at their headquarters in Essex in 1999, and ran a further two courses per year. It was decided that as from 2005, the two training courses would be merged and initially there would be two courses per year. Never has the course been so popular, with a high level of take up. The course is undergoing a full review, and looking towards the potential to further accreditation, beyond the recognition of PAW and ACPO. The course could not have been so successful if it was not for the very valuable contributions and support from the partners, notably National Wildlife Crime Unit, Natural England, RSPB, RSPCA, JNCC, RBG Kew, BCT, LACS, UK Border Agency, and others. With the sale of Bramshill (the current home for the course) the training will continue but from a new home, with a potential venue being explored in Central England. The week-long course covers a wide variety of subjects, with a main aim “To equip officers with the ability to undertake investigations in a safe and efficient manner within a multi-agency framework where appropriate”. The course cost for 2014 is £750.00, which includes accommodation.